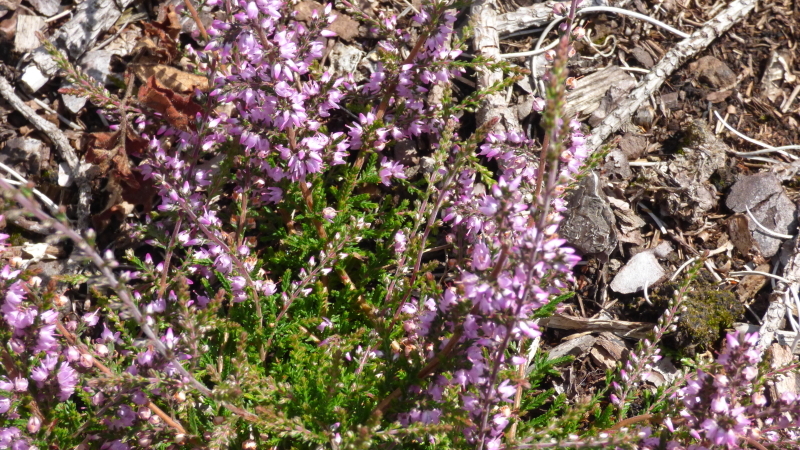 There are lots of species of heather and most of them have the scientific name Erica. However perhaps the commonest in Britain is Calluna vulgaris which is also often called Ling. It is the only species in the genus. The difference is that the flower is made up of 4 petals and 4 sepals where as in the Erica genus it is 5. This is the commonest in the Wye valley and there was a very small amount growing on our patch of Ninewells wood when we bought it some years ago. Back then it was a Corsican pine forest and very dark, so the heather was up against it. Once the pines were felled and the disturbance from heavy forestry machinery was becoming a fading memory (nightmare), heather started to spring up all over. Evidently the seeds can survive in the soil for 70 or more years. The first plants flowered in 2015 and now in 2017 many areas are quite pink with a carpet of heather all in flower. Flowering time is August /September. Individually the flowers are quite small and a lilac/pink colour, not as impressive as the Erica species. There is a little Bell heather (Erica cinerea) growing and this has larger flowers and they are decidedly purple. They are also not really a woodland species, more dry heathland, where as Calluna will grow in woods, especially if they are fairly open. They also flower a few weeks earlier than Calluna. In this photo you can see the Bell heather surrounded by Calluna which is in bud ( the little white dots). Very occasionally you do get Calluna with white flowers, this is the so called Lucky heather that many years ago gypsies would try to sell to you. Also the name of an irksome TV programme from the 1960’s with Moria Anderson and Jimmy Stewart. My parents loved it… you can guess what I thought of it as a teenaged boy. If you are wondering what it was like here is a U tube link to it White Heather Club. I digress, as often I do. Back to Calluna vulgaris. 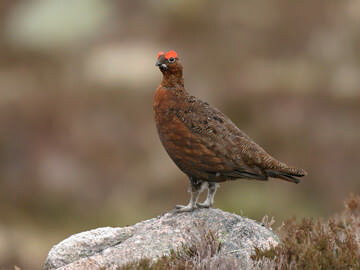 It is the main food plant of Grouse, but not in the Wye valley as they are not found here, although they are not far away, being found on the Brecon Beacons, and in parts of Shropshire, so who knows they could turn up. Grouse eat the young tips of the Calluna, however as Calluna ages it becomes rather scrubby, it is after all a woody plant it is really a very low growing bush, so after about 10 years of growth it is largely woody and with very little green growing tips… not so good for grouse to feed on. However when it is like this it does provide a good sheltered place for Grouse to hide in and to nest in. 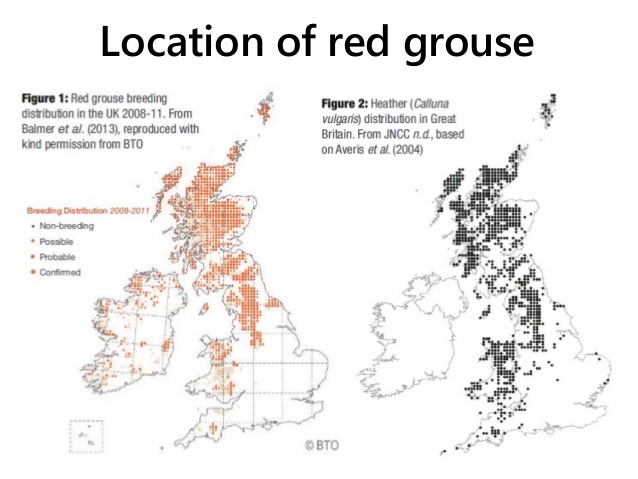 So in order to maintain a good population of grouse ( what the gentry likes, so they can shoot them…. glorious 12th and all that) you need some young heather for food and some old heather for shelter. Thus on large estates in Scotland where Grouse shooting takes place, regular controlled burning of the moorland is undertaken. After burning, seeds in the soil quickly germinate and after a couple of years an almost lawn of young heather develops. Ten years on this will become scrubby and old and need re burning. And so it goes on. Did you know that you can find Red Grouse in Gloucestershire… in Cirencester at a restaurant called ‘Eat Wild’ and I believe they cost £60 a course and are available soon after 12th August. However a true foodie would rather wait a week or so, in order that the birds are properly hung and develop a good flavour… This is similar to the Beaujolais Nouveau run…. all hype and commercialism and with out gastronomic merit. In Merlin’s cave, in the Wye valley (Herefordshire) bones of Red grouse have been found, probably dating back to the last ice age. Another did you know… Red grouse can reach speeds of 80mph soon after they have taken off, making them quite difficult to shoot. 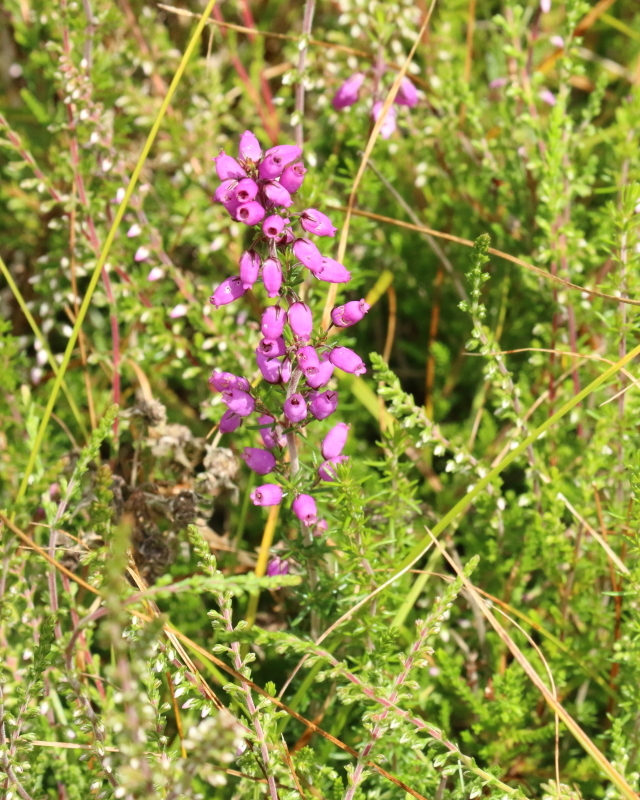 Other species associated with heather are the Emperor moth, Lizards and Adders, and of course bees and Heather honey is a specialty in some areas.